G olf Swing Magic (originally published as The Four Magic Moves to Winning Golf) is a different kind of golf book. Actually, to say that it is different is a mild understatement. It is radical, heretical, iconoclastic. We expect that it will stir violent controversy. Golf Swing Magic is different for several reasons. First, we do not go along with those whose thought — though unspoken — is that most golfers are hopeless. We do not believe that a player who scores habitually around 94 or 98 or 110 should be left to freeze at whatever altitude he is struggling. That player, and any player, can be helped, and helped a great deal. We believe he can be taught to play a very respectable game.
" anybody in possession of all his physical members and mental faculties — barring only those who are too old, or too young, or too weak — can play much better golf than he plays now." But he can be taught only by learning all over again how to swing the golf club. We believe that anybody in possession of all his physical members and mental faculties — barring only those who are too old, or too young, or too weak — can play much better golf than he plays now. And we will show you how it can be done. In order to do this, we take a completely fresh approach — the second difference from other golf books. This is where the heretical and hence controversial aspect begins to show itself. In thinking about the swing, in teaching the game, in experimenting over the years, and in reading and listening, we have come to the conclusion that a great deal of what is said and written about golf is wrong. A great mass of misinformation has accumulated. We propose to sweep that misinformation away. Many of the most revered, almost sacred, precepts, will be given some harsh treatment. A lot of them will be shown up as complete, though innocent, frauds. If good golf is to be learned and the poor player is to improve, a purging must take place, painful as it may be. Only in this way can the new swing, based on the proper principles and movements, be built. Here, perhaps to soften the blow, it should be explained to the faithful how the false doctrines on which they have depended for so long, ever came to be established. The golf swing always has been an elusive, almost mysterious, thing. Back in the 1950's, with no high-speed photography to aid them, no moving pictures, only the naked eye to tell them, the golf experts at the turn of the century had to do a lot of guessing, theorizing, and rationalizing. They ascribed reasons and causes for things because the reasons and causes seemed to fit. There was no microscope under which the swing could be placed and the theories proved or disproved. All this led to a great, uncontrolled growth of ideas. Many of these, through long reiteration, came to be accepted as sound principles. Actually they were convenient conjectures, some of the rankest type, but for lack of proof to the contrary they have been looked upon as pearls of wisdom. They still spring out at us today, almost automatically, in such hackneyed exclamations as: "I looked up." "You quit on the shot." "Pull down with your left hand." These banalities have conditioned our thinking about golf until, truthfully, we have become lost in them. Hence, much that we have learned must be forgotten, deliberately banished from our minds. Feelings that we have grown accustomed to must be extirpated. Actions that have become second nature to us must be somehow intercepted and prevented from taking place. In short, the board must be wiped clean. Once that is done we will proceed to our third main theme: the elimination of errors.
" for the average golfer the mistakes that are most costly are bad shots off the tee and through the fairway. These get him into all kinds of trouble ? into woods, traps, rough, brooks, ponds, out of bounds, and what have you." Any football coach will tell you that football games are not won; they are lost by mistakes. The same concept can be applied to golf. Good scores are rarely the result of a succession of brilliant shots. They result from the absence of many bad shots. Conversely, the bad round of golf is the result of a lot of bad shots. In other words, what might have been a good round or a winning round, is lost by mistakes. These mistakes can be of many kinds. Most of the top pro's mistakes come on or around the greens. He hits a short pitch or a chip that doesn't get close to the hole, or he misjudges the speed or roll of a green and takes a putt too many. These usually make the difference, for him, between a 71 and a 67. 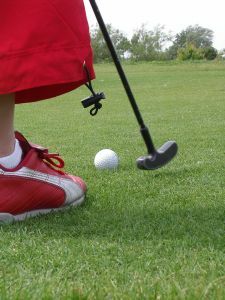 But for the average golfer the mistakes that are most costly are bad shots off the tee and through the fairway. These get him into all kinds of trouble — into woods, traps, rough, brooks, ponds, out of bounds, and what have you. These mistakes, in turn, stem from a swing that is basically bad. The bad swing, in its turn, is caused by a failure in execution at one or more of four critical points. Furthermore, golfers make the same mistakes at the same points, and this is true whether you test the point with two golfers or two thousand. Their mistakes can be broken down into the same basic wrong movements, occurring at the same critical places in the swing. This is one of the few definite, invariable patterns to be found in the bad golf swing. These we have called the Four Fatal Flaws. Most poor or mediocre players manage to incorporate all four into one swing. Others have fewer, and score better. Our purpose is to expose these Four Fatal Flaws, examine them, explain them, eliminate them, and replace them with the right actions, which become the Four Magic Moves. With the right moves instead of the wrong ones your swing will be better, your mistakes will be fewer, and your score will be lower. Some of the Magic Moves will be new to you, and they will feel strange and awkward, as any new action does for a while. We can only insist that you follow our instructions to the letter, for we know that if you do the result will be very quickly apparent in the way the ball goes and the way you feel as you hit it. During the explanation you will be given a picture and an understanding of the swing, particularly of the puzzling action of the club head, that will be entirely new. This is one of the most important parts of our book. It embodies a mechanical principle — the conservation of angular momentum — which has never before been explained in connection with the golf swing. This, indeed, borders on the magic. An understanding of this principle alone will make golf an easier game. After dealing with the full swing we will go into a detailed description of the short game, including putting, the trouble shots, and, finally, the strategic mental or thinking side of golf. With this you will have acquired the knowledge and the weapons for a golf game far better than any you have known. It will then be up to you to use them.